Because I’ve spent my life studying diversity, that’s what first struck me about this year’s fab-five of U.S. women’s gymnastics. I was proud—and even more so because so many others have also commented, with pride, about this team’s diversity. Only later did I even notice how high Gabby Douglas was flying, how fast she was spinning, and even then the diversity remained at least as thrilling. 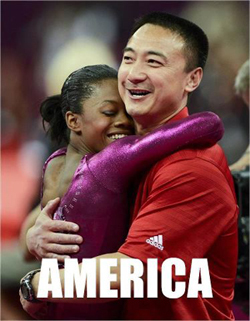 The picture above is of the African American Douglas hugging her Chinese-born coach Liang Chow, and, of course, the focus has been on Douglas for all sorts of historical and—with that smile—personality reasons. But there’s also Jordyn Wieber with her Lebanese grandmother, Aly Raisman whose Jewish Heritage led her to use “Hava Nagila” for her floor exercise, and for me, Filipino through and through, my favorite: Kyla Ross, the team’s youngest member. Her father is African American and Japanese. Her mother is Puerto Rican and…Filipino. The only member whose ethnic identification is kind of mushy is McKayla Maroney, but with that “Mc” and that “Maroney,” the Scots-Irish might as well join the celebration. It’s been just over 21 years that more Americans have approved of interracial relationships than haven’t. In 1991 the scale finally tipped: 51% in favor, 49% against. The Yes side has steadily grown, partly because the number of interracial children has grown even faster, making the very concept of “race” more complicated by the minute. (Read a longer piece on this, my “Miscegenation and Me.”) Inter-ethnic relationships, which are only sometimes inter-racial, have gone on so long that the white ethnicities especially have mostly given up even keeping track, let alone understanding, what their particular ethnic groups—the Germans, the Poles, the Swedes, etc.—have contributed to the making of America. It’s an immeasurable loss. 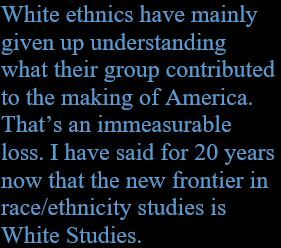 I have said for at least 20 years now that the new frontier of race/ethnicity studies is Whiteness Studies. Whites claiming more of their ethnic heritage, seeing themselves not as “just” white, would go a good way towards damping down racism—the thing many call our country’s original sin. America’s sense of its diversity should grow ever greater and greater. If it flew as high as Gabby Douglas does, it would make us more proud to be from as many different strands as we are. It would help make discrimminating against someone because of color or backgroud seem not just mean and immoral, but really trivial compared to celebrating how someone’s difference makes us all richer. ♦ This post is part of a series on London. Go to Lead Post in series. This entry was posted in Diversity & Multiculturalism, Reviews & Commentary and tagged Aly Raisman, diversity, ethnicity, Gabby Douglas, interethnic relationships, Interracial relationships, Jordyn Wieber, Kyla Ross, Liang Chow, McKayla Maroney, Olympics, U.S. Women's Gymnastics 2012, White Studies. Bookmark the permalink.